This CellML model runs in OpenCell and COR but does not recreate the published results. The model is based on the authors original XPPAUT.ode file which can be found at www.math.fsu.edu/~bertram/software/islet/BJ_05. The units have been checked and they are consistent. We are unsure why the CellML model is not recreating the published results. ABSTRACT: Insulin secretion from pancreatic beta-cells is pulsatile with a period of 5-10 min and is believed to be responsible for plasma insulin oscillations with similar frequency. To observe an overall oscillatory insulin profile it is necessary that the insulin secretion from individual beta-cells is synchronized within islets, and that the population of islets is also synchronized. We have recently developed a model in which pulsatile insulin secretion is produced as a result of calcium-driven electrical oscillations in combination with oscillations in glycolysis. We use this model to investigate possible mechanisms for intra-islet and inter-islet synchronization. We show that electrical coupling is sufficient to synchronize both electrical bursting activity and metabolic oscillations. We also demonstrate that islets can synchronize by mutually entraining each other by their effects on a simple model "liver," which responds to the level of insulin secretion by adjusting the blood glucose concentration in an appropriate way. Since all islets are exposed to the blood, the distributed islet-liver system can synchronize the individual islet insulin oscillations. Thus, we demonstrate how intra-islet and inter-islet synchronization of insulin oscillations may be achieved. Schematic diagram of the pathways described by the mathematical model. 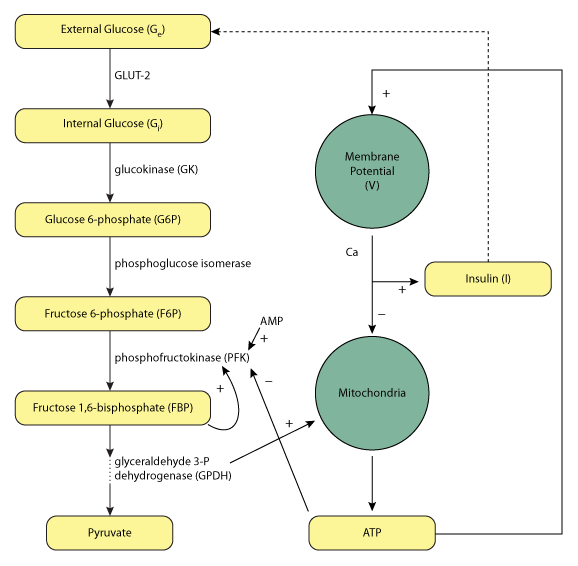 Extracellular glucose (Ge) enters the pancreatic beta-cell through GLUT-2 transporters in the plasma membrane, and is subsequently broken down through a series of enzyme-catalysed reactions in the glycolysis pathway. The metabolic products of the glycolysis pathway feed into the mitchondria, the site of aerobic respiration, where they are used to produce ATP. ATP represents the common substrate, linking the metabolic (glycolysis) and electrical (membrane potential) components of the mathematical model by regulating the flow of potassium ions through the K(ATP)-channels in the plasma membrane. In turn, these control regulate the membrane potential and calcium ion flow leading to insulin secretion. Insulin acts to lower the plasma glucose concentration though the functions of the liver (represented by a dashed line). Derived from workspace Pedersen, Bertram, Sherman, 2005 at changeset 54a5b1477c85.